The Copa del Rey cup goes to Atletico Madrid, after a 1-2 win against Real Madrid, in the Santiago Bernabéu. The Colchoneros claimed their first win in 14 years against the Merengues, as they managed to comeback in the game, following an early goal by Cristiano Ronaldo. The Portuguese star would get ejected with a straigh red card during the extra-time period, after responding with a kick to an harsh foul from Gabi. 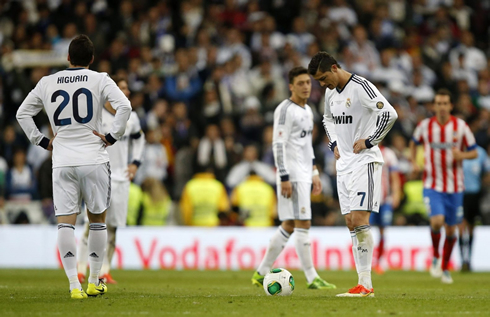 After the failure in both La Liga and the Champions League, Real Madrid has come off short once again, this time in the Spanish Copa del Rey. The Merengues got defeated by 1-2 against Atletico Madrid and lost their last chance to still lift a big trophy this season. Cristiano Ronaldo got the opener from a brilliant header in the beginning of the game, but soon everyone would realize that Atletico Madrid had decided to bring a lot more intensity into this game. Diego Simeone's pupils tied the game thanks to a goal from Diego Costa and would get in front during the extra-time's first half, from a header by Miranda. José Mourinho and Cristiano Ronaldo ended up sent off from the match, which somehow may give rise to more speculation about one or the two of them leaving Real Madrid during this Summer. The last 14-years head-to-head record between Real Madrid and Atletico Madrid was clearly favorable to the Merengues. In this period, not a single loss had been registered for the club who holds 32 La Ligas and 18 Copas del Rey, but despite what history could have suggested for this Friday night clash, Diego Simeone's side managed to make their own destiny and beat José Mourinho's men. The game was hosted at the Santiago Bernabéu but the home stadium factor didn't seem to have helped Real Madrid that much. Both clubs were given the same amount of entrances to hand out to their fans and truth has to be said that the Colchoneros support and cheering has always sounded louder than the Merengues. One of the strongest weapons from Atletico Madrid resides in their energy and the fighting spirit that seems to come from their own manager, Diego Simeone. Facing this team in a cup final game and not levelling the attitude to theirs is surely halfway to failure. That being said, it also doesn't take much to understand that Real Madrid's biggest aspiration for this season has obviously been the UEFA Champions League. After exiting the competition a few weeks ago in that semi-finals clash against Borussia Dortmund, it would be extremely hard to get the team refocused in the remaining goals, one of those being precisely this Friday's night Copa del Rey. Atletico may have started the game trailing the game after an early goal from Ronaldo, but they clearly got the better of Real Madrid in terms of attitude and intensity. Cristiano Ronaldo gave an early lead to Real Madrid, after responding with a superb header to a Mesut Ozil corner-kick, still inside the first 15 minutes. For a moment, everyone thought history from the last 14-years was about to be repeated and that the Merengues weren't going to let this opportunity of winning another cup to slip away. This has actually been Ronaldo's 9th header goal this season, his 55 in all competitons. Atletico Madrid's response came just a few minutes later though, in a terrific play initiated by Radamel Falcao. The former FC Porto and River Plate forward outclassed both Raúl Albiol and Sami Khedira making use of a brilliant display of skills, before sending through a great pass to Diego Costa. The Brazilian striker kept the ball moving forward a few more meters and struck with conviction to the far post. Diego López still stretched his arms, but the shot had just been too strong to be blocked. With 1-1 on the scoreboard, everything was back to square one. There would be no more goals being scored during the second half though, and as time passed by, Real Madrid was showing signs of a growing frustration. Atletico Madrid was playing rough and tough as they are used to and the referee's compliance was simply driving the Merengues out of their mind. José Mourinho got ordered to leave the pitch in the 75th minute, after protesting a referee decision by the sideline. Later in the game, it would be Cristiano Ronaldo who got shown a straight red card, after hitting Gabi in the nose with his boot, following another hard tackle from the Spanish midfielder. However, the Colchoneros reached the winning goal a few minutes before Ronaldo's red card, from a header by Miranda, who had been left all alone inside Real Madrid's penalty area. Diego López found himself helpless to do anything to prevent it and Atletico Madrid would hang to that 1-goal lead until the end, as if their lives depended on it. The Merengues can also blame a good amount of bad luck during this match, as they've hit the posts three times and wasted several great opportunities to get more goals. Nevertheless, it's Atletico Madrid who will celebrate tonight and Real Madrid may very well start preparing the next season, despite still having two more games left in La Liga, agended to be played in the upcoming two weeks. 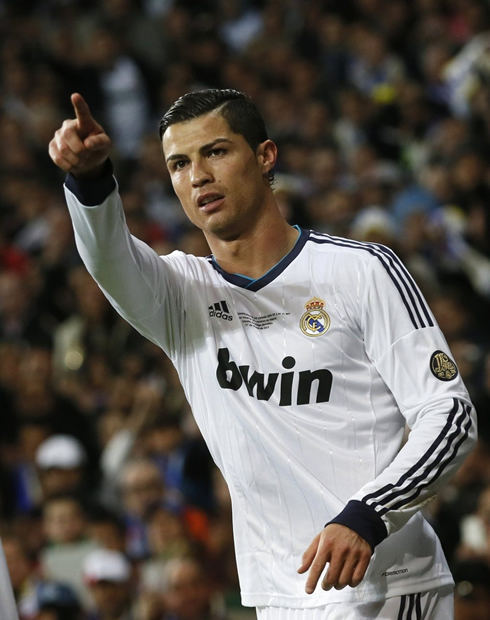 Cristiano Ronaldo next game for Real Madrid will be against Atletico Madrid for the Copa del Rey Final, on May 17, 2013. You can watch Juventus live stream, Real Sociedad vs Real Madrid, Barcelona vs Valladolid, WBA vs Manchester United and Chelsea vs Everton, all matches provided from our soccer live streaming section.